STANFORD, Calif. – The No. 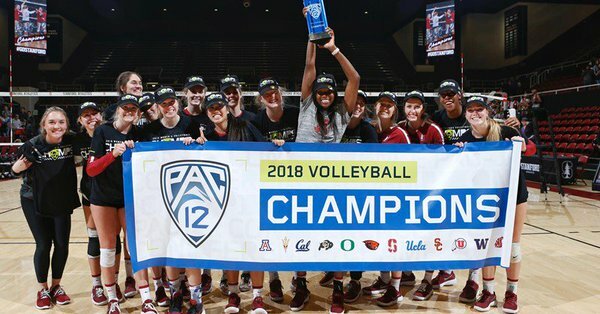 2 Stanford women’s volleyball team captured its 18th Pac-12 championship with a sweep over Oregon State, Friday, at Maples Pavilion. The Cardinal (24-1, 16-0 Pac-12) left no doubt even without reigning national player of the year Kathryn Plummer, who did not play Friday. Stanford pushed its win streak to 22 and its nation-best home winning streak to 31. Libero Morgan Hentz flew all over the court, racking up 20 digs in the sweep. The junior accounted for more than half of the team’s total digs (39). Junior setter Jenna Gray spread around the offense, totaling 34 assists to go with four kills, three digs and three blocks. Redshirt sophomore Michaela Keefe played in place of Plummer and finished with a match-high 11 kills. Junior opposite Audriana Fitzmorris added nine kills on .381 hitting and six blocks, while sophomore Meghan McClure chipped in with seven kills, seven digs and two aces. Senior middle blocker Courtney Bowen started her second consecutive match and finished with six kills on .364 hitting and five blocks. Freshman middle Holly Campbell matched her career-high with eight blocks and had three kills. As a team, Stanford hit .271 and held Oregon State to a .069 clip. The Cardinal posted 14.0 blocks and five aces. Stanford is now 68-0 all-time against Oregon State. Oregon State was led by outside hitter Amy Underdown‘s nine kills and eight digs, while sophomore Maddie Goings totaled eight kills and 11 digs. Stanford has now won 21 conference championships all-time. In addition to 18 Pac-10/12 titles, Stanford won the Nor-Cal league in 1977, the WCAA in 1984 and the Pac-West in 1985. Stanford travels to the Pacific Northwest to take on No. 19 Washington State on Friday, Nov. 16 and No. 25 Washington on Sunday, Nov. 18.